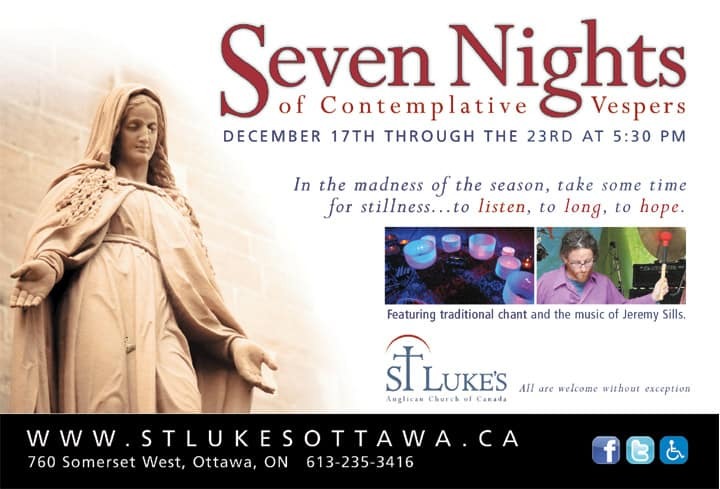 For seven nights, from Tuesday, December 17th through Monday, December 23rd, the soothing sounds of the healing crystal bowls of Jeremy Sills mingle with traditional Gregorian chant in the darkened candle-lit sanctuary of St Luke’s–an opportunity to escape the season’s frantic bustle and relax in the holy hush of sacred sound and silence. A choir from Voice Emergent will be leading the chants at this nightly service of contemplative vespers and the bowls will lead us into twenty minutes of quiet meditation. Everyone is welcome, 5:30-6:30, at any or all of these quiet, restful, restorative services.